Yesterday was World Communion Sunday. It was started in 1933 by a Doctor Hugh Thompson Kerr and happens on the first Sunday of October. Out our church, we celebrate communion every day. Since it happens often, we really have to find within ourselves the resistance to make this practice a “ritual.” I hope that you find meaning in your continued practice. I pick up the small oblong cracker we use for communion as the words start. My heart grows weary as I hold it between my fingers–I imagine our Lord and Saviour whole, holy, and sinless. I imagine Him thinking of us as His children and looking towards the sacrifice He was going to endure in the last moments of His life. I’ve always heard, “You’re either part of the solution or part of the problem.” I have to be part of the problem that Jesus is the sole (and soul) solution to. I prepare myself in an instance for what happens next. “When He had given thanks”–I’m thankful for Him being the solution. I have just a split second to be thankful before the words come. “He broke it.” I quickly think of how Jesus’s body was broken for us. I think about the nails I held in my hand the many times I sinned. It was for me and others around me that His body was broken. I take a deep breath, remembering the wafer in my fingers. I then, after a pause of reflection of the symbolism of the bread breaking, break the bread. I feel as if my breath catches. I fight back the tears as I imagine my beloved Lord being crucified willingly. A new wave of thankfulness flows in me as I bring my attention back to the words being said at the table, “This is my body, which is for you.” He not only suffered and died for me–His whole life and presence on earth was (is) for me. I have to remember and be thankful in every day of my life. In the same way, after supper he took the cup, saying, “This cup is the new covenant in my blood; do this, whenever you drink it, in remembrance of me.” (1 Cor. 11:25). This is the blood that washes me clean. I have barely had the time to fully remember the birth, life, and death of our Lord when these words enter my ears. It is His gift of love that solidifies the New Covenant. The blows of my hammer upon the nails on His cross may have caused the blood, but His willingness and righteousness frees me. He wants us all the be free. I turn to you. What do you do to remember and proclaim the Lord’s death in communion? I remember His resurrection and victory over death. But, how do you remember the body and the blood? After weekly “Lord’s Suppers,” it is easy for us to fall into a trap of complacency. It is easy for us to tune out during this time of worship. But we have to remember that this is the main reason the early church met. They met together, ate together, and shared the Lord’s supper as part of the meal. (see Acts 20:17, Acts 2:24-47). How does communion affect you? What do you do remember during communion service? Please comment in the comment section below. Communion is very important to me, as well. It’s definitely not something to be taken lightly. 1 Corinthians 11 tells us how *not* to do it, definitely. The people in the church at Corinth were eating it as a meal. Some weren’t getting any bread. Some were getting drunk. Those who had nothing were being humiliated by those who got it all. Paul wrote that it was *not* the Lord’s Supper they were keeping, and they were in fact sinning against the body and blood of the Lord. That’s a heavy charge! They were taking communion without thinking about what it represented, *and* without thinking of one another. An important thought: We, as believers, *are* the Body of Christ! When we sin against the Body, we sin against *His* body. When we sin against the Body, we sin against the Holy Spirit who baptized us into the Body. We are *not* identifying with His sacrifice, in the way we are supposed to share the bread and wine. 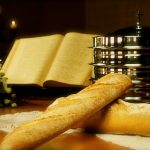 Paul writes: 1 Corinthians 11:26 “For whenever you eat this bread and drink this cup, you proclaim the Lord’s death until he comes.” This is the purpose of communion…to proclaim/identify with the Lord’s death until He comes. When I take communion, I think on how I am to identify with His death. It is through faith in the work He did for me on the cross. But it goes even deeper. This is a good passage on this topic: Romans 6:3 “Or don’t you know that all of us who were baptized into Christ Jesus were baptized into his death? 4 We were therefore buried with him through baptism into death in order that, just as Christ was raised from the dead through the glory of the Father, we too may live a new life. If we have been baptized into Christ Jesus (this is speaking not of water, but of baptism by the Holy Spirit into the Body (1 Corinthians 12:13)) by faith, this *means* we have been baptized into His death. What does that even mean? It means we consider ourselves *dead* to sin. We consider ourselves part of a new Body….one consisting of many members, but all working together, with Christ as head (also 1 Corinthians 12). It means we no longer consider ourselves, but show love for one another. It means we do not go on sinning, that grace may abound, but on the contrary, consider ourselves set free from sin to serve the living God. It means we live a *new life*. Remembering the physical act of what Christ did *and* joining in His sacrifice through offering our living bodies as instruments of righteousness is how we proclaim His death to the world, until He comes…the bread and wine being the symbol of this intimate communion with Him. This communion that states when Christ died, so did we. When Christ was raised from the dead, so were we. He is in us. And we are His Body. Thank you for your comment, Dana. There are so many things that the Bible says on this issue (whether directly or indirectly as all roads lead to Christ). One thing I find lacking in a lot of walks is perhaps the meditation part. Communion gives me a chance to focus my meditation on what He accomplished on the cross and the hope for His return! Praise be to God!